Hey dolls! Today I have photos for you of a brand that’s new to me. The Aliquid Lacquer Two Pleasant Peninsulas collection features five shimmers and three glitters inspired by the owner’s home state of Michigan. Aliquid Lacquer Cherry Festival is described as a bubblegum pink crelly with red and silver-green hexes, plus gold shimmer and flecks. The formula was great, applied evenly, and I didn’t have any issues with dragging. Two coats were used for opacity. 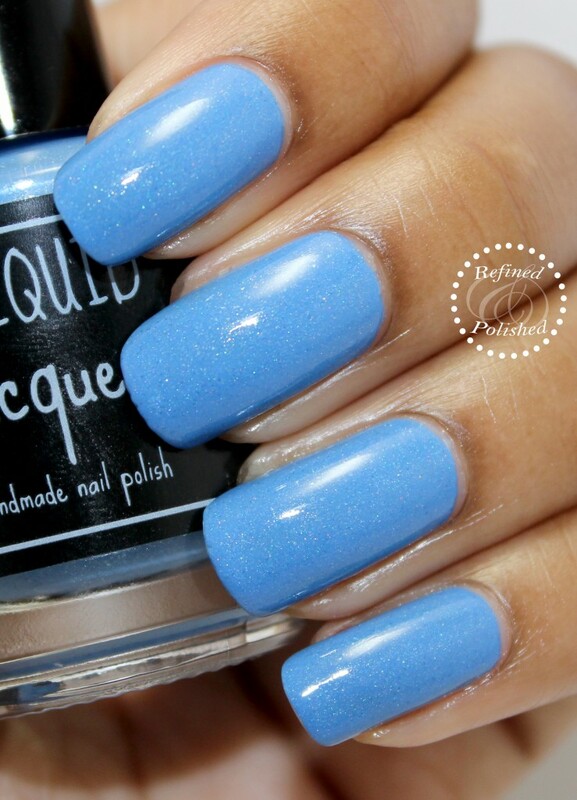 Aliquid Lacquer I’m Heading Strait to Mackinac is described as a serene blue polish with a soft holographic effect and flecks of green, blue, and silver. The crelly (creme-jelly hybrid) formula was thicker than all of the others in the collection, but was very easy to apply. It was pigmented and self-leveled perfectly in two coats. I’m still wearing this polish now and it’s so gorgeous! 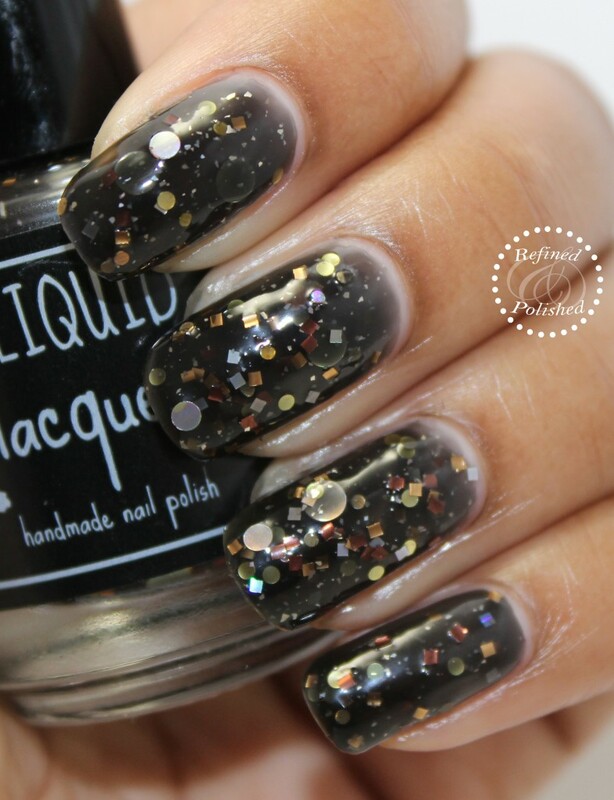 Aliquid Lacquer Lake Michigan Sunset is described as a sheer slate grey polish with flecks of gold, orange, and pink. I just love this polish! It was very sheer on the first coat, but built up nicely without any dragging. Three coats were for opacity. 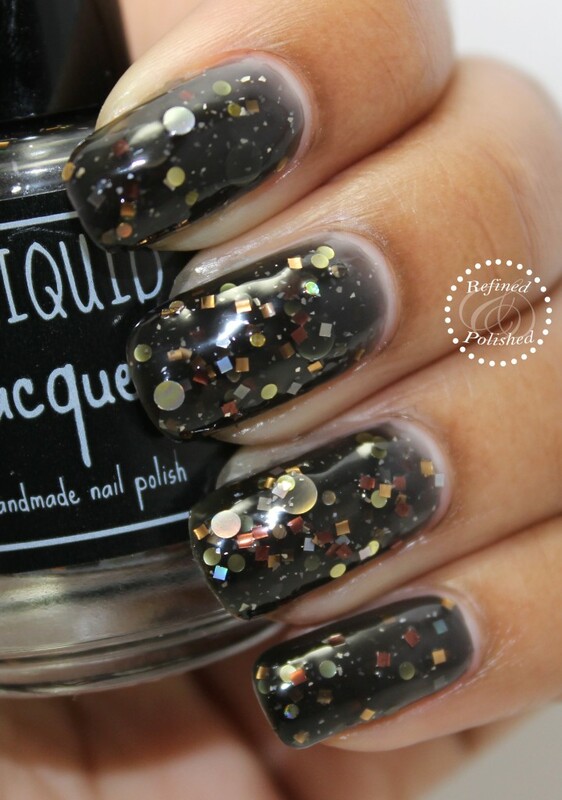 Aliquid Lacquer Motor City is described as a black jelly with metallic and holographic circles and squares in various sizes, plus silver flakes. This one is a little too chunky for my tastes, but I do like the color combination of the glitters. The formula applied easily, but I would recommend waiting a few minutes in between coats to prevent dragging. Three coats were used for opacity. Motor City would also look good layered over black. Aliquid Lacquer People of the Three Fires is described as a brick red polish with sparkles of blue, purple, and red. I like the orange undertones in this polish. The crelly formula was thick like I’m Heading Strait to Mackinac, but in a good way. It was easy to apply, nicely pigmented, and opaque in three coats. Aliquid Lacquer Petoskey Stone is described as a warm grey with green, gold, and brown shimmers, plus holographic sparkle. This shade pulls very taupe on me. At first I wasn’t sold on it, but the more I look at the photos, I’m starting to like the uniqueness of it. The formula was great and applied evenly in two coats. 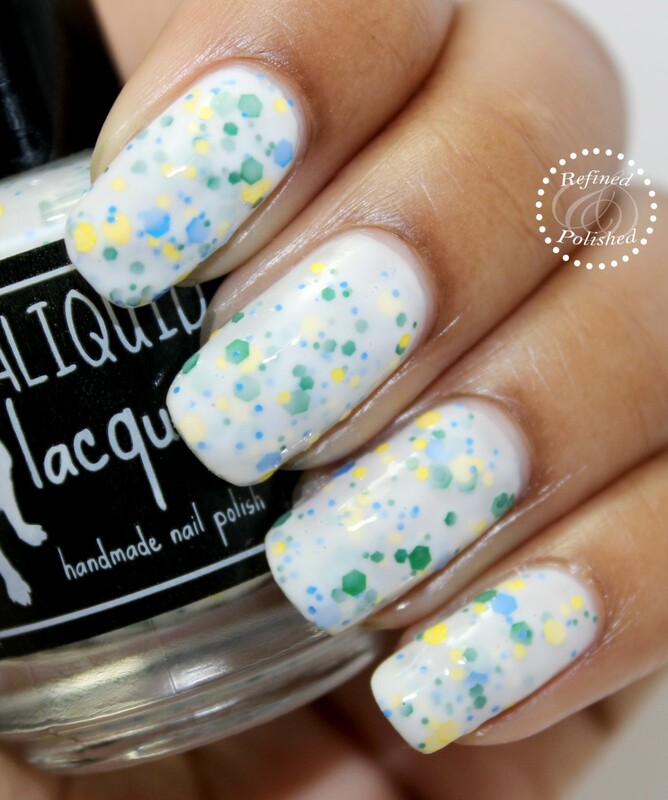 Aliquid Lacquer Wolverine Loves Spartan is described as a white crelly with matte green, blue, and yellow hexes. The formula applied easily, but I did need to move the glitters around on the nail to fill in empty spaces. Two coats were used for opacity and top coat was needed to smooth out the glitters. Aliquid Lacquer Yooper is described as a dark green jelly with flecks of green, blue, gold and brown, plus holographic sparkle. This is one of my other favorites from the collection, as the shimmer is amazing! The jelly formula built up well in three coats and did not drag as additional coats were added. Overall, this is a fun collection from Aliquid Lacquer and I’m really impressed with this brand. The shimmers are especially unique. The Aliquid Lacquer Two Pleasant Peninsulas collection is currently available for $10 each ($4.50 for 5mL mini) on their brand new storefront website as well as on Etsy. 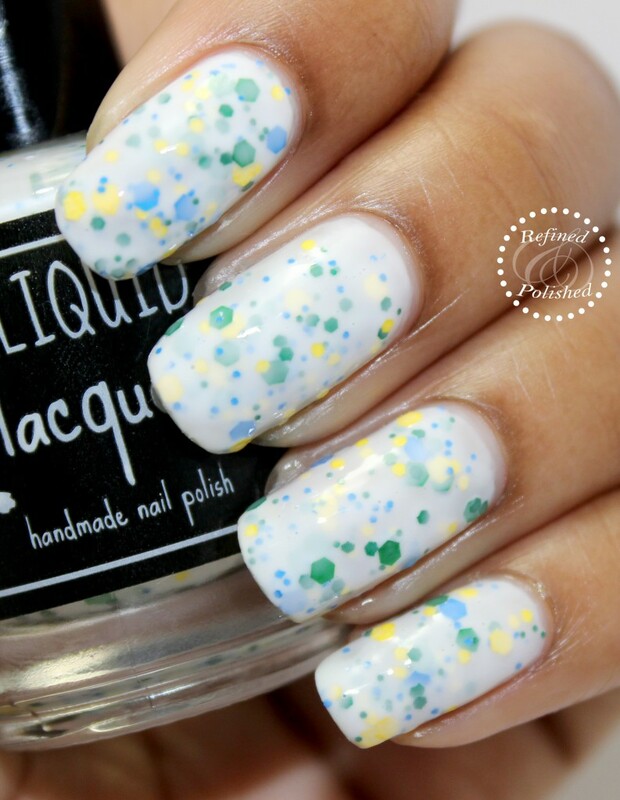 Alison, the creator behind Aliquid Lacquer, also runs a blog which features her brand and many others. She has graciously provided all R&P readers with a 10% discount off of a $10+ purchase using the code REFINED10 . on her Etsy site. There is also 15% off everything on her new storefront website to celebrate the grand opening, so it’s a great time to purchase. Be sure to keep up with them on Facebook, Instagram, and Twitter for updates!